Milbemycin oxime is a broad-spectrum antiparasitic active ingredient used in veterinary medicine in dogs and cats against internal parasites (e.g. roundworms). It is not used against agricultural and household pests. It belongs to the chemical class of the macrocyclic lactones. Type of action: Systemic & contact broad-spectrum endoparasiticide and ectoparasiticide. Main veterinary parasites controlled: roundworms (nematodes), incl. heartworm prevention (Dirofilaria spp), mites. The table below indicates some usual dosing recommendations for milbemycin oxime issued by manufacturers or documented in the scientific literature. They may not be approved in some countries. Milbemycin oxyme is a macrocyclic lactone with a broad spectrum of activity that is used exclusively in dogs and cats, so far only for oral administration (tablets, chewables, etc). It is effective against heartworms and numerous other roundworms and also against a some mite species. However, it is ineffective against tapeworms and flukes and other external parasites. Warning! : Tolerance and safety margin in dogs with the MDR-1 mutation (e.g. Collies) sensitive to ivermectin are higher for milbemycin oxime than for ivermectin. Consequently the recommended dose can be admnistered to dogs with de MDR-1 mutation, however puppies are more sensitive. In sensitive dogs the recommended dose of 0.5 mg/kg should not be exceeded bacause the therapeutic margin is lower than in the non-sensite dogs. WARNING: Dogs of some breeds do not tolerate macrocyclic lactones or other medicines (e.g. emodepside) that can cross the blood-brain barrier. They can suffer more or less serious adverse effects if treated at dose rates slightly higher than the recommended ones. Consequently dosing must be as accurate as possible. This is the case for Collies and related breeds, which have a mutation in the MDR-1 gene that affects the blood-brain barrier and makes it more permeable to such compounds than in dogs without this mutation. Besides Collies, other dog breeds have shown similar problems, although the MDR-1 mutation has not been confirmed in all of them. The breeds more affected by this mutation are (% frequency): Collie (70%), Long-haired Whippet (65%), Australian Shepherd (50%, also mini), McNab (30%), Silken Windhound (30%), English Shepherd (15%), Shetland Sheepdog (15%), English Shepherd (15%), German Shepherd (10%), Herding Breed Cross (10%). Other less affected breeds are: Old English Sheepdog, Border Collie, Berger Blanc Suisse, Bobtail, Wäller. The only may to be sure that a dog is affected or not is to test for it. As more dogs are tested it is likely that the mutation is discovered in other breeds, or that the frequencies change. Learn more about milbemycin oxime safety. In pets: Yes, reported to ivermectin in heartworm microfilariae in the USA (so far particularly in Louisiana), with cross-resistance to macrocyclic lactones, including milbemycin oxime. 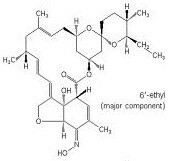 Milbemycin oxime is a macrocyclic lactone obtained from fermentation products of the soil microorganism Streptomyces hygroscopicus var. aureolacrimosus. It is a derivative of the milbemycins and not of avermectins as several other macrocyclic lactones (e.g. ivermectin). It is used only on dogs and cats, alone or in combination products (e.g. with lufenuron, a flea development inhibitor; or with praziquantel, a taenicide). NOVARTIS has not developed a livestock product with milbemycin oxime. Milbemycin oxime at the therapeutic dose is an effective heartworm (Dirofilaria spp) preventative and it controls a few other roundworms (e.g. Ancylostoma spp, Angiostrongylus vasorum, Crenosoma vulpis, Toxocara canis, Toxocara cati, Trichuris spp). Some mite species may be controlled at higher doses. Milbemycin oxime alone at the therapeutic dose is ineffective against tapeworms, flukes, fleas, ticks, lice, mosquitoes and flies. There are combination products to broaden the spectrum of activity: with lufenuron or spinosad to control fleas, and with praziquantel to control tapeworms. After oral administration to dogs milbemycin oxime is quickly and almost completely absorbed. Peak plasma concentration is reached 2 to 4 hours later, and subsequently declines with a half-life of 1-3 days. Bioavailability is about 80%. In rats, metabolism seems to be complete, since unchanged milbemycin oxime was not found in urine or feces. High concentrations of milbemycin oxime are found in the liver and in body fat. As a general rule, due to a different pharmacokinetic behavior the anthelmintic effect is longer for milbemycin oxime than for ivermectin, although this strongly depends on the delivery form and the administered dose. As all macrocyclic lactone milbemycin oxime acts as agonist of the GABA (gamma-aminobutyric acid) neurotransmitter in nerve cells and also binds to glutamate-gated chloride channels in nerve and muscle cells of invertebrates. In both cases it blocks the transmission of neuronal signals of the parasites, which are either paralyzed and expelled out of the body, or they starve. It also affects the reproduction of some parasites by diminishing oviposition or inducing an abnormal oogenesis.